From washed out to electric shades, coral has been seeing a comeback these last few summers as one of the season’s hottest shades. It looks amazing against tanned skin and has the versatility to be worn during beach days or on party nights. Stylist’s tip: pair it with gold statement jewellery and creamy coral lips for an amazing evening combo, playing with different shades of coral to give a tonal feel. For playful beach days get hold of electric coral nailpolish and pair it with a punchy coral bikini. Whichever way you decide to wear it, this is one of summer’s gifts that keeps on giving. 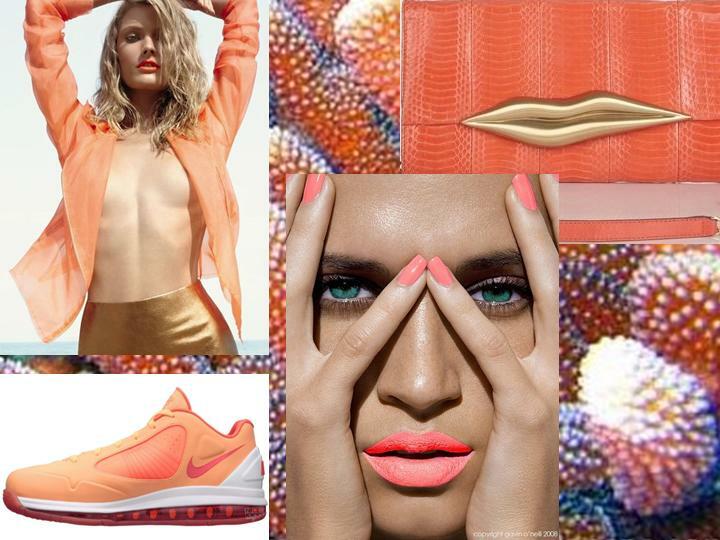 Images (clockwise from left): Constance Jablonski for Vogue Brasil, Diane Von Furstenberg Carolina Lips clutch, electric coral lips and nails (image by Gavin O’Neill), Nike Air Max 360 BB low peach cream/bright coral.